Standing out from the competition is one of the most challenging parts of owning a small business. Maybe you have a better-trained staff, extended hours, faster and cheaper shipping, more frequent offers and promotions, or highly rated customer service. You can and should use all of these things in your marketing to attract, convert, and retain customers. Join us for a free webinar on how to build stronger relationships by sending timely, relevant emails to your subscribers. But you also have one thing that’s uniquely yours, which will always set you apart from your competition. It will never be eclipsed by a competitor, and you will never stop being the world’s foremost expert on it: Your own small business story. In this blog post, I’ll discuss how you can use storytelling to build connections with your customers and how to communicate your story through email and social media. Your business’ story, and the passion, personality, and human face you can put to it, gives you a major advantage over larger businesses when it comes to your ability to market yourself. You can demonstrate your expertise in person. You can relate to your community. You can give people the promise that when they come in to buy a product or get a service, they’ll have a genuine, human interaction. And that’s what customers are looking for from small businesses. Peter Lovis, owner of The Cheese Shop in Concord, Massachusetts, knows that people are his greatest resource. Every customer who buys his cut-to-order cheese speaks to a well-trained staff member. And Lovis is confident that once one of his employees starts talking cheese with a customer, a sale is in the bag. It’s not just about selling the most expensive cheese, but matching the customer with the right product for their price point, Lovis said during an episode of our Small Biz Stories podcast. Lovis also involves the Concord community with dairy-driven events, including a cheese parade in early December and a butter battle planned for the spring. Even though giving that level of great customer service is probably second nature to you, it actually is an important part of what we call engagement marketing, and really helps you build customer relationships. Provide a “wow” experience, which gives you an opening to ask customers to connect with you further and sign up for your mailing list. Then, continue to engage with your existing customer base by sending valuable content to drive repeat business. Those loyal, happy customers then want to share their great experience with their friends and family and spread the word about you, driving new customers to your door. Email marketing is a great platform for using storytelling to build and reinforce connections with your customers. Every email you send should have a picture, a paragraph, and a call to action. Even if your call to action is a direct “buy now” request about a specific product or service, you can use your email marketing to inject personality into the way you package that call to action. 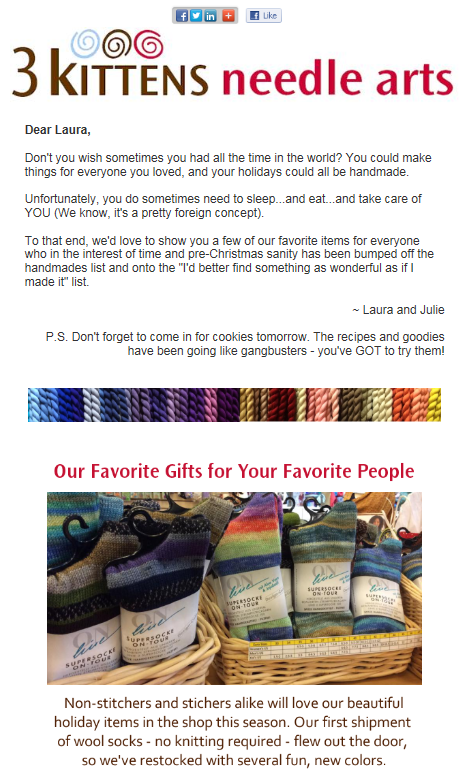 Appealing to last-minute shoppers before the holidays, 3 Kittens Needle Arts, a yarn and needlepoint shop in Mendota Heights, Minnesota, sent out a holiday gift guide with pre-made gifts available at their store, with a friendly, personalized message from the owners. They also reminded customers to take advantage of their “Holiday Cookie Fridays,” a promotion they ran as an incentive to get people in the door — not only did their staff bake for customers, they also shared recipes for them to make at home. For a salon, use before-and-after pictures of a client’s hair style, with a link that asks readers to book their appointment with that specific stylist. A restaurant with a signature dish could show a hyper-lapse or highlight video of their kitchen staff preparing it, along with a coupon for 10 percent off that item. After holding an event, a bookstore staff could create a simple “thank-you” video to send to their attendees, asking them to sign up to learn more about future events. Social media also gives you an easy opportunity to showcase your story and personality, and interact with your customers. Before Winter Storm Jonas hit the East Coast in January 2016, the Pinot Boutique in Philadelphia took to Facebook and Instagram to remind fans to stock up on wine before record snowfall hit the region, using funny memes and sharing news stories about the coming storm. The wine shop regularly uses social media to highlight its customers, including photos and even videos with quick customer testimonials. Featuring real customers in your marketing and showing that their input matters will connect them to you and encourage them to continue their relationship with your business. Show behind-the-scenes photos of your location or your employees in action, getting your store ready for business before it opens, or unpacking a shipment of a popular item. Take advantage of trends like “Throwback Thursday,” by sharing an old photo of your business with the hashtag #TBT. Share curated content your followers will find helpful or entertaining, so your social profiles become hubs for information they enjoy. One of the only drawbacks of storytelling is if you make your story all about you. Make sure the stories you are providing are valuable to your audience, and look for opportunities to involve them directly. 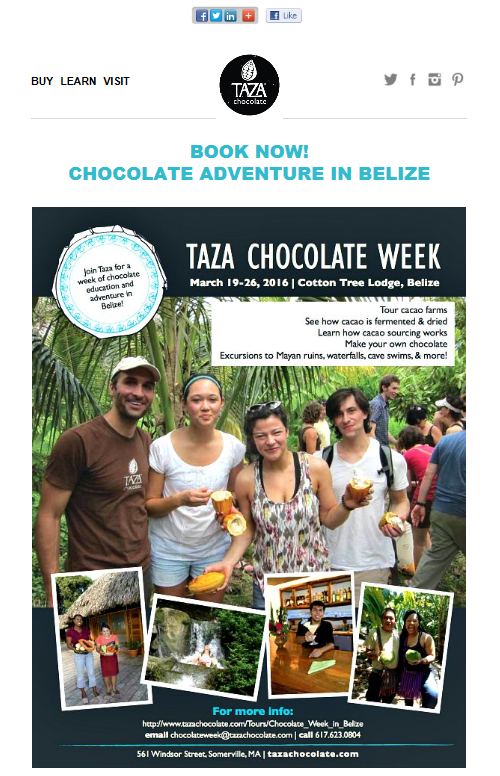 Taza Chocolate, a business in Somerville, Massachusetts, offers “Taza Chocolate Week,” an opportunity for a limited number of customers to join a trip to Belize and learn how the company sources the cacao beans for its chocolate, then follow the process all the way through to making a chocolate bar using Taza’s recipe. Invite the people who subscribe to your email newsletter to an exclusive shopping event, where they can receive even more personal attention from you and your staff. Offer a workshop to teach people how they can get the most out of a popular product. Invite people to participate in a photo contest showing off your products or services, and use the photos in your email marketing, on your website, and on social media. Let your customers in on your story! Take a moment to jot down three stories to share in your marketing materials. Do you remember the first sale you ever made? What first inspired you to start your business? Sharing your unique stories lets your audience get to know you and inspires them to trust your business. Try it out in your next email newsletter or social media update. Constant Contact contributor. I obsess over small business success and marvel at their great work, every day.